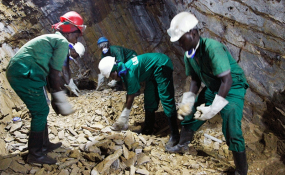 Miners at work inside Mageragere mining site in Nyarugenge District (file photo). Four people have been confirmed dead while two others were critically injured in cassiterite mine collapse in Mageragere Sector, Nyarugenge District. The accident happened on Monday mid-afternoon as the six mine workers were going about their daily mining activities, according to the sector Executive Secretary, Christopher Ntirushwa. The deceased were confirmed as Fabrice Habamungu 35, Cyprien Nkizinkiko 49, Emmanuel Niyongira 34 and Claude Muhawenimana 20. Three of the deceased were residents of Mageragere while the other was a resident of Muhanga District. The two who were injured are Aloys Harerimana 37 and Phenias Ndimukaga 44. They were rushed to Nyarurenzi health centre where they are receiving treatment. Both are residents of Mageragere. "The collapse of the mine was caused by recent heavy rains that have made the soils soggy," said Ntirushwa. The mine belongs to ETMIN Ltd.
Ntirushwa told The New Times that it is the first time the sector, which has three mines, has witnessed such an accident.